It started with Warhammer 40k (just 40k from now on), I imagine. Nope; before that. It started with a heavy metal CD cover. Say 20+ or so years ago, I used to buy music albums based on their covers. I know, shallow, but I was young and dumb; because I played RPGs at the time album covers with fantasy or sci-fi themed art attracted me. 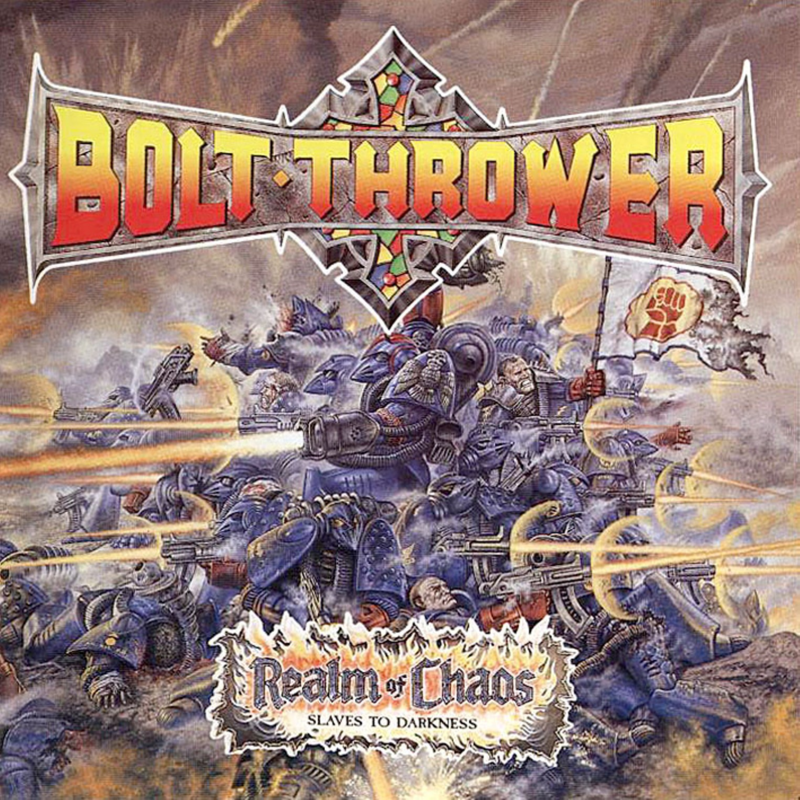 I stumbled upon Bolt Thrower’s Realm of Chaos. I loved the look of it, and picked it up. Brutal album. Not long after that, I was at Enterprise 1701 in Orlando (now called Sci-Fi City and at a different location) and lo and behold, I see some miniatures that are on that Realm of Chaos’ album art. Intrigued, I picked up the starter box for 40k. 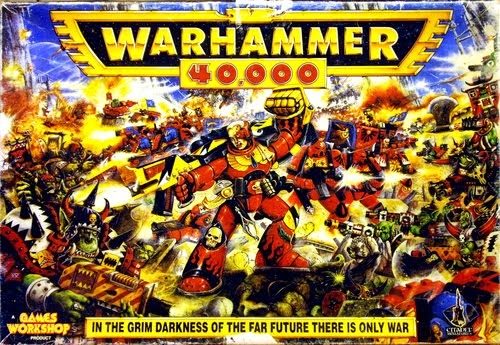 For about 20 years, I have had an on-and-off-again love affair with 40k, and miniature gaming. In one aspect I love modeling. In another I hate it. It is a relaxing hobby, that is incredibly rewarding on its own. However, as I have gotten older, I find painting models fatiguing and a burden. Tragedy really. My brother has been my opponent this whole time, and honestly, I just can’t keep up with him. In the end (as I am calling it now) I don’t see myself continuing with the hobby. He knows more rules, paints more models and is a better player. Before you ask, my brother is fantastic to game with. Easy-going, friendly and competitive and honestly, he is the reason I have played it this long. Here is the thing. I love the game. If it weren’t for the modeling (or if I had the disposable income to purchase pre-painted armies) I would probably continue playing 40k. However, I don’t know that I am, yet, I know that I am not selling my armies. It can be hard to start playing some of these games or systems. The amount of history and information can be substantial and you just don’t know where to start. ASL is no different. However, Wikipedia has a great article on it, and it is a great place to start. Take the time to absorb it all and just have fun with exploring the rich history of the game and community. So why did I decide to invest in ASL? I never want to say that a game that someone loves is wrong; the thing that others love in a game, may be the actual thing that makes me not like it. So this isn’t a list of good and bad, rather a comparative approach between what I know and what I am learning. HOLY CRAP 40k can fill a room fast. Big models, lots of models, big cases and lots of cases. Terrain. Tables. 40k, takes space and lots of it. There is nothing you can do about it. You either make 40k a prominent place in your home (like my brother does with multiple display cases) or you have to inconveniently put it out of the way when you are done and inconveniently get it all back out. A real pain. In 40k you choose what your army will be, and how it is made up. This is such a tedious process they make software to do it for you. And after two decades of creating these lists, it is nice to come to the table and have a scenario already together for you. The number of squads, guns and tanks are listed on the Scenario Card, dig out your counters and away you go. 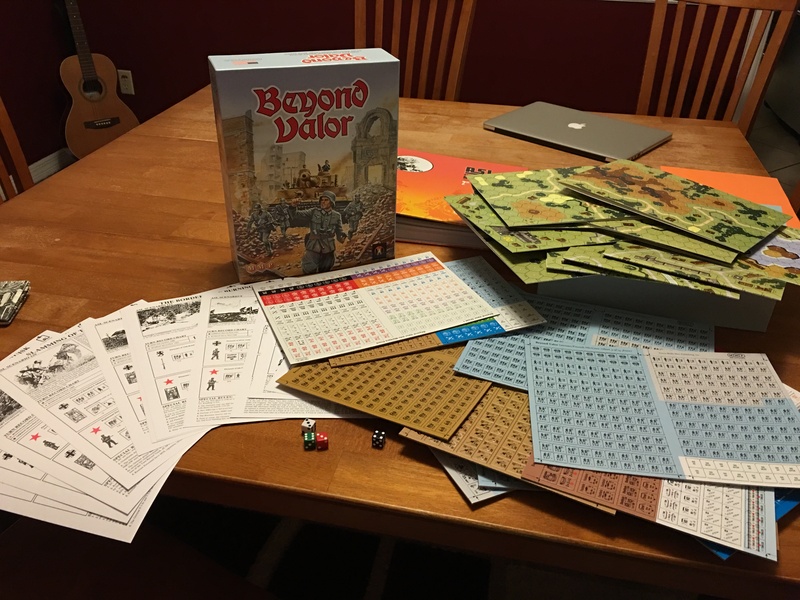 I have already mentioned in this blog earlier how I used to know the lore of some games better than I know actual history. Again, I won’t say there is anything wrong wit that, rather, I am getting to a place in my life where I appreciate knowing actual things versus fictional things. I don’t even consider knowing about games, childish, rather, our own Earth’s history is just more enticing to me now than what it used to be. This comparison is more about table space than anything else. It just takes a smaller footprint on a table than 40k does. And that is kind of nice. It is common for me to have to stand up for most of a game of 40k, and there is something epic and exciting about that, it is also nice to be able to play a full game of ASL whilst sitting. I suspect that will be a bigger deal as I get older. ASL isn’t cheap. 65 bucks for a rule book! Whoa! This is where 40k is down right wrong. I know I said that I wouldn’t say that but, I am. 40k is just too expensive. It really seems as though Games Workshop does their best to take as much money as possible from their fans. Google it, you will find many posts and discussions on the topic. It is unfortunate, really, as this is the main reason why I am not compelled to continue in the hobby. I just can’t financially keep up. I know I have thousands of dollars invested into 40k. And I will hold on to those models until I die, but I just can keep spending that kind of money on it. I am new to ASL. I have the Starter Kits 1 and 3, the full ASL rulebook and the first module Beyond Valor. I am sure that I will buy more, but I don’t have to in order to be a part of a community of ASL’ers. And even as my love for 40k waning and my love for ASL is waxing, I am excited to be alive in this place and time. To meet new people and to get together for a common love of gaming and history. And in the end, I will learn the rich history of World War II and about the valor and courage of the men and women that sacrificed so much for the people and countries they loved and served, and fun doing it.